Emphasize that your bodies are now the temple of God (1 Cor. 6:19) and we must take care of them. Plan and prepare a healthy meal together and have a family exercise night. Research ways to have better nutrition. The Adventures of Junk Food Dude is an excellent book for children to learn about healthy food choices. Here’s the link to see and hear it read on YouTube. 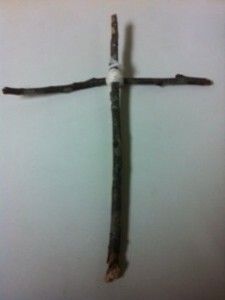 Make a cross out of twigs or craft sticks and keep it in a prominent place during the Easter season. Point out that it is empty because Jesus didn’t stay on the cross or in the tomb . . . He is alive!! 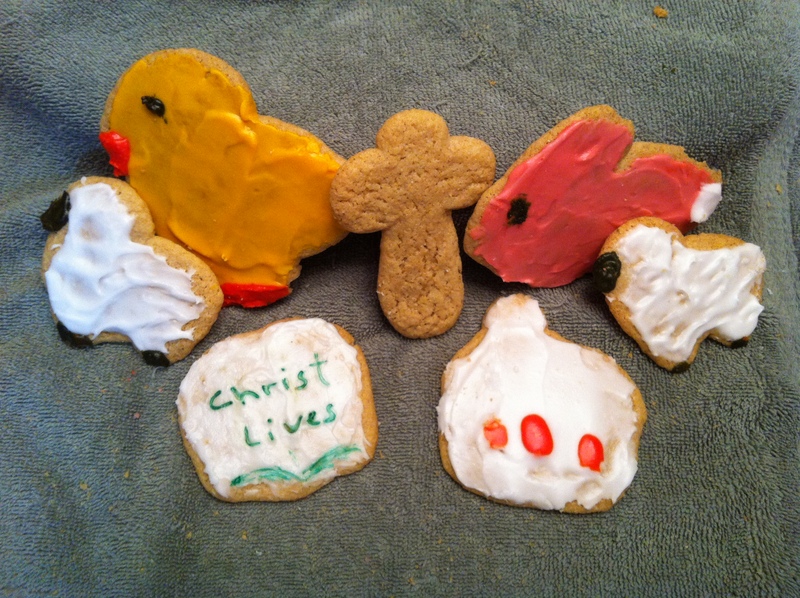 Let your children enjoy the secular traditions of Easter, but be just as intentional in telling them about what Christ was doing that first Easter. Read all about Palm Sunday at Day One of Passion Week. Tell the story with enthusiasm to your children. 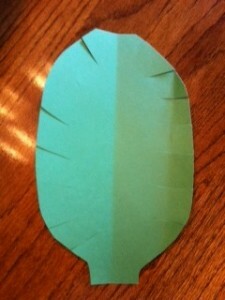 Make palm leaves out of green construction paper or white paper and paint green. 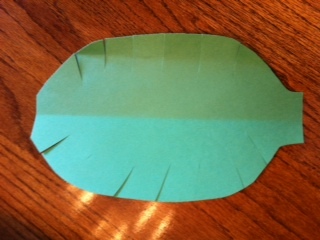 Let children cut into the edges to make the leaves. Act out the story: use a stick horse or a broom as the donkey or even let dad be the donkey 🙂 Let one child be Jesus and as he rides into the city, the rest of the family can wave the leaves. Have fun teaching the Greatest Story ever told this Passion Week!! Follow Train Up The Child for information and ideas all week. Easter, the celebration of the resurrection of Jesus, is our most important Christian holiday. 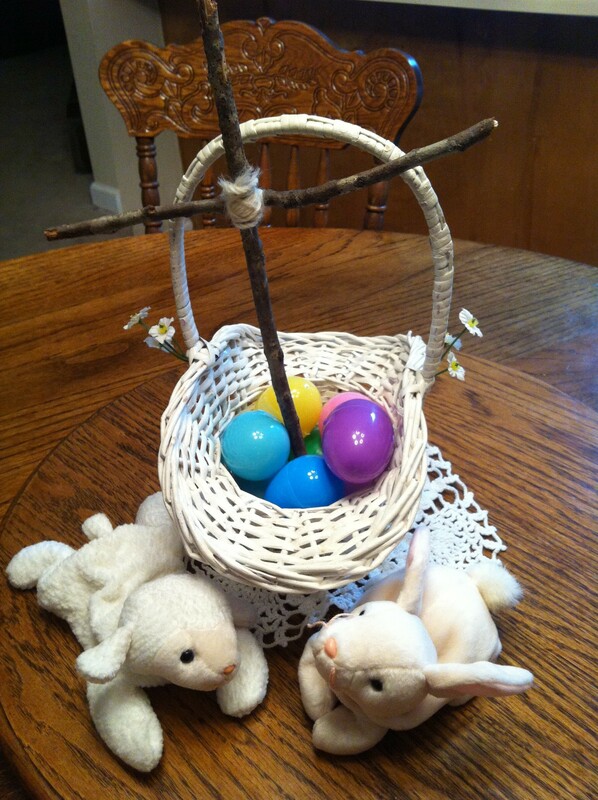 Because it comes at springtime, some of our traditions at Easter are actually a part of the pagan springtime celebration. The name Easter is from Eostre, an Anglo Saxon goddess of Spring. The resurrection of Jesus coincided with the springtime celebration for this goddess. Through the years Christians began to incorporate the pagan springtime traditions with their celebration of the Resurrection. But that was ok, according to Pope Gregory in AD 695, as long as they gave new meaning to the pagan traditions. The Pope wrote a letter to Saint Mellitus as Mellitus was on his way to England to conduct missionary work among the pagan Anglo-Saxons. Pope Gregory suggested that converting heathens would go easier if they were allowed to retain the outward forms of their traditional pagan practices and traditions, while reinterpreting those traditions spiritually towards the Christian God instead of to their pagan “devils”. 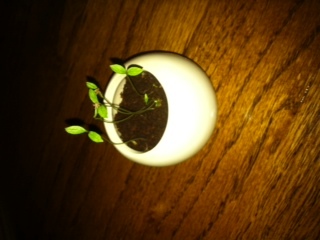 Easter basket – Middle Eastern cultures had spring traditions of celebrating the first seedlings of their new crops. They brought them in baskets to their temples for sacrifices so that their gods would continue to bless the crops for the rest of the year. But Easter gives us the assurance that God will continue to bless us because of the once and for all sacrifice of His Son Jesus Christ. And always put a cross in the basket. It can be a chocolate one or possibly one you have made together. Bunnies – In the 13th century hares and rabbits were symbols of fertility because they reproduce so rapidly. Rabbits were the sacred animal of Eostre, the goddess of Spring and fertility. A possible reason for the link between the rabbit and the egg comes from the Pagans associating the rabbit with the moon and the egg with the sun. Easter comes during the spring equinox when day and night are the same length, thus the rabbit and the egg are together. The bunny can be a reminder of the Resurrection. 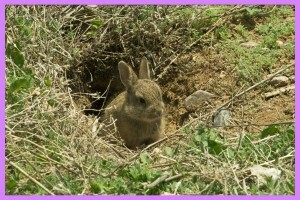 The bunny stays underground much of the winter and comes out in spring. Jesus was in the tomb 3 days and then came out of the tomb alive! 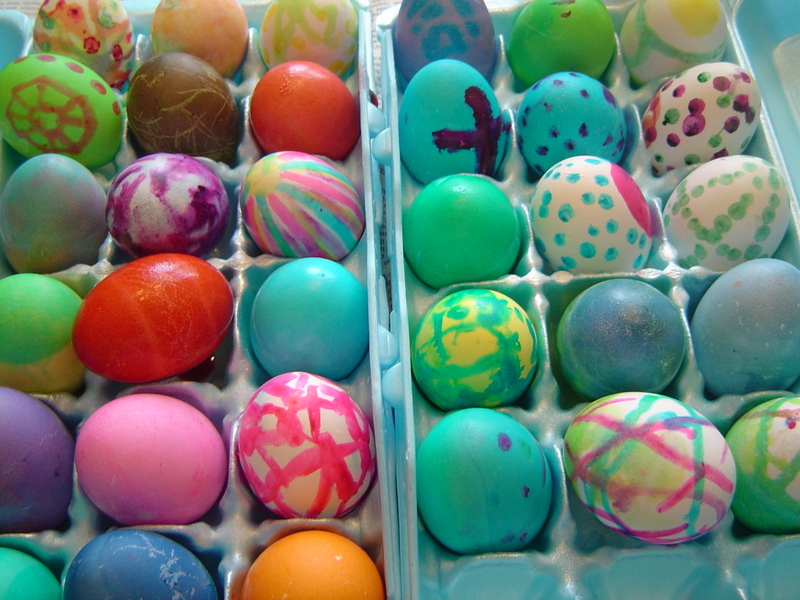 Colored Eggs – The Bible tells us in Revelation 21:5 that Jesus makes all things new. 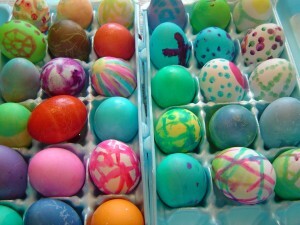 The eggs remind of us of new life. 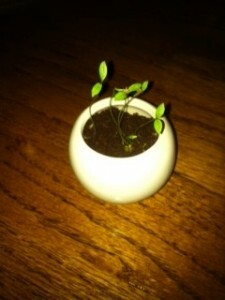 Jesus gives us new life when we become a Christian. 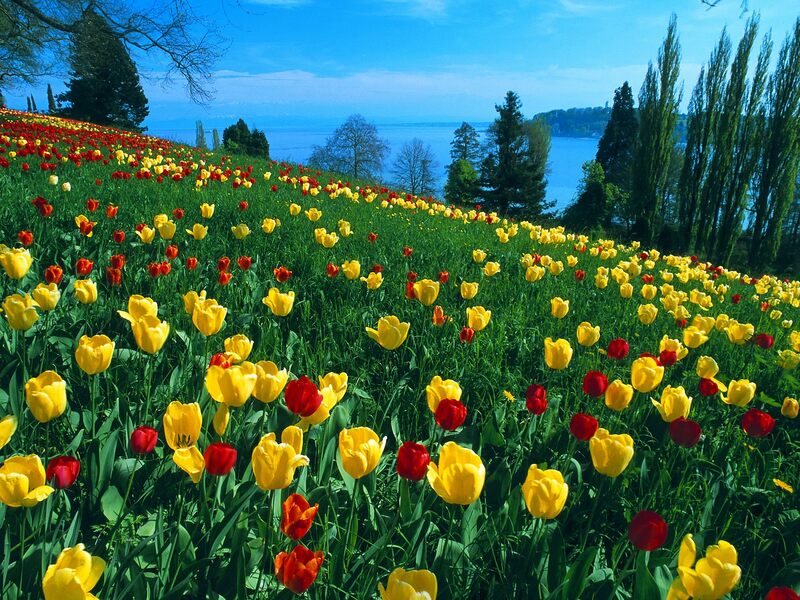 The coloring reminds us of how beautiful the world is as it comes back to life after the winter. 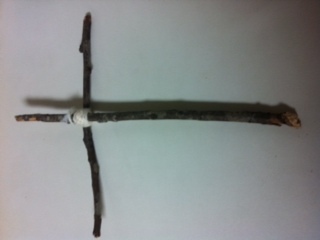 This is a reminder of Jesus coming back to life on Easter morning over 2000 years ago. 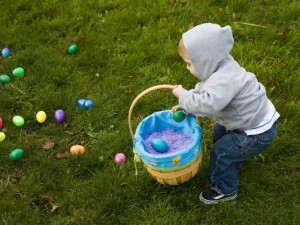 Hiding Eggs – The history of hiding eggs goes back to possibly when the Pagans used eggs in their Spring celebrations. After early Christian influence, the Pagans hid their eggs to avoid persecution. Another possible reason for hiding eggs is because they were forbidden during Lent, so symbolically they were hidden and found at the end of Lent. Before you hide the eggs this year, share with your children that the true meaning of the holiday gets hidden in the activities of the season and we need to hunt for the true meaning – that Jesus died for us and is risen from the dead. Revelation 21:5 Jesus makes all things new. Galatians 2:20 Jesus Christ lives. Matthew 28:6 Jesus is risen. 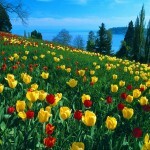 Song of Solomon 2:12 The flowers appear on the earth. Psalm 103:5 God satisfies my mouth with good things. 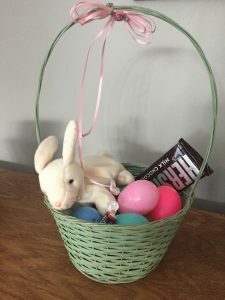 Make one egg empty like the tomb and give a prize for the one who finds that egg which represents the true message of Easter, that Jesus is alive! Have a happy Easter with your children, enjoying the traditional Easter activities and relating them to the greatest event in history – the sacrificial death and resurrection of our Lord and Savior Jesus Christ!!! For more information and resources for celebrating Easter with your children, just search ‘Easter’ on this site.